Are you a long-awaited android user who is looking for easy solution to transfer WhatsApp messages from android to your new iPhone 6 set? Don’t worry as here you will get the best recommended solutions on how to make this task possible. And Mobile Trans is best available option for this purpose. 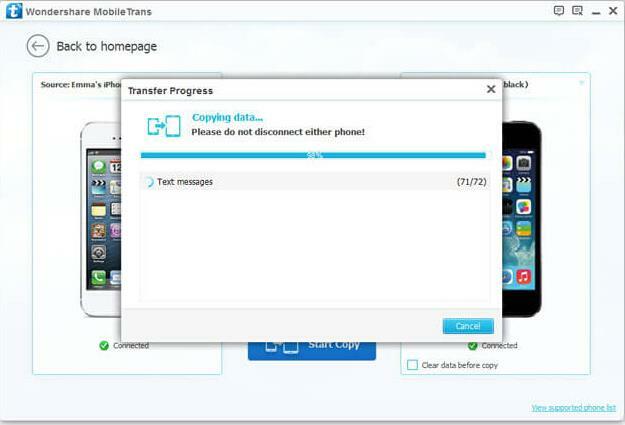 Transfer data between two devices of any operating system, except Windows mobile. The interface is highly simple and straightforward. Transfer text messages, whatsapp chat, applications, call logs, music, images and videos, contacts, and so on. Nowadays, it is a trend to have a new phone and why not if such feature full devices available in the market. Buying a new phone is always delightful but when it comes to transferring data from your old set to a new one then it can be a very hectic task as the process can be a bit trickier. Here are some best applicable methods discussed that will help you out to transfer you whole WhatsApp messages from your old Android to new iPhone 6. 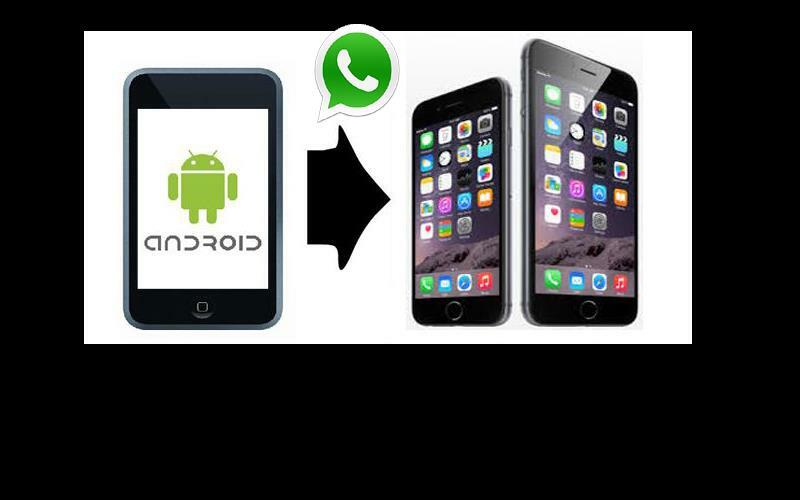 Here you will get the best solution of how to transfer WhatsApp Messages from Android to iPhone 6. You have to just follow the mentioned steps properly to migrate WhatsApp from Android to iPhone free without any problem. Step 1: on your old android set, go to the setting option at WhatsApp. From the setting click the “Chat settings”, option then tap to “Email chat” from the displaying list. 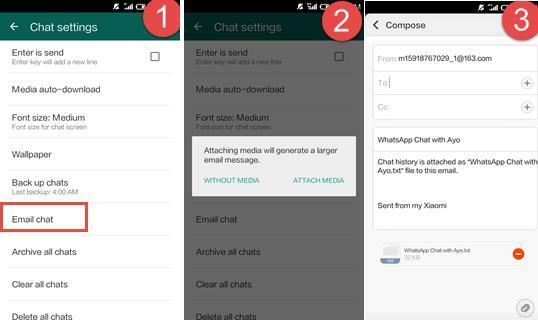 Step 2: choose the WhatsApp messages or history that you want to transfer here you will get a pop-up window saying that “Attaching Media will generate a larger email message”. According to your need click to the “Without Media” or “Attach Media” option. Step 3: now enter your email number at the sending interface and click to the “Send” option. Step 4: Log in with your email id at your new device, you can view your WhatsApp messages at email from your new device but you can’t sync these messages to your WhatsApp application. Note: it is not suitable for huge messages transfer. It could be a troublesome task to email messages from contacts one by one. Step 1: Firstly you need to keep back up of your WhatsApp messages on your old device. then go to the setting at whatsapp from your old device and tap to the “Chat Settings” option, then click “Email chat” from its showing list. Step 2: Uninstall WhatsApp application from your old device. Step 3: After then, in your new device, install WhatsApp and register with your original phone number. You will see a pop-up window will appear saying that the messages backup was found. 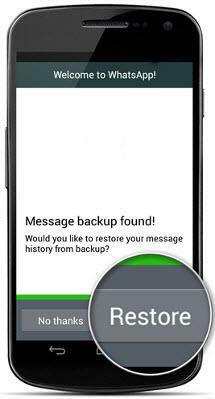 Step 4: After getting the backup click to the “Restore” option and transfer WhatsApp Messages from Android to iPhone. Wait till the complete transferring process gets over. Note: it is very important to uninstall WhatsApp first from the old device and then install it on your new device. This is the right way to restore messages backup. For perfect and easiest transferring of WhatsApp messages, you need to use Wondershare MobileTrans. This software easily transfers the messages between two devices without requiring any intermediate. The compatibility of this tool involves Android, iOS and Symbian platforms. So it’s not that compulsory for the two devices to run on the same operating system. 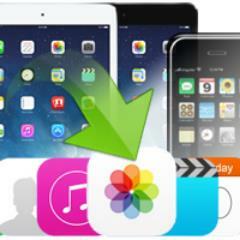 This software is specially designed to transfer data like contacts, messages, music, photos, videos, and calendar. Also with many other data like WhatsApp messages from your old phone to new iPhone 6. It can also recover iTunes backup and transfer to iPhone 6 effortlessly. It works superbly with all iPhones which include 6 Plus/5s/5c/5/4S/4/3GS running iOS 9/8/7/6/5. First, install and then launch Wondershare MobileTrans on your computer and then connect your old phone to iPhone 6 plus through 2 USB cables. 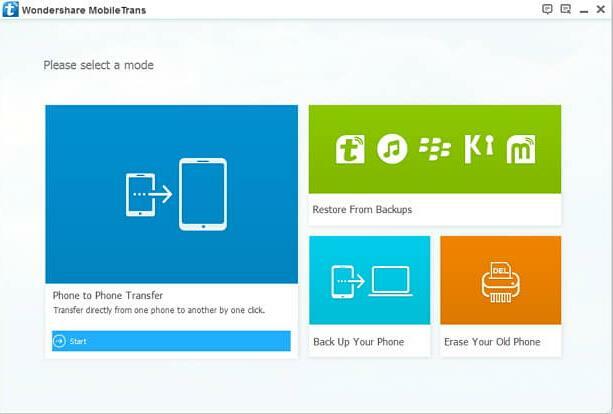 You will see phone to phone transfer in the main window. Just hit on it and you will see the below mentioned window. Click on the start copy where you can see the transfer is on progress. After that process ends, all the data gets transferred to your new iPhone 6 plus. All the three above-mentioned methods are the best way on how to transfer WhatsApp history from Android to iPhone 6. This will surely help you in perfect transferring of your messages but it’s up to you with what method you want to go.